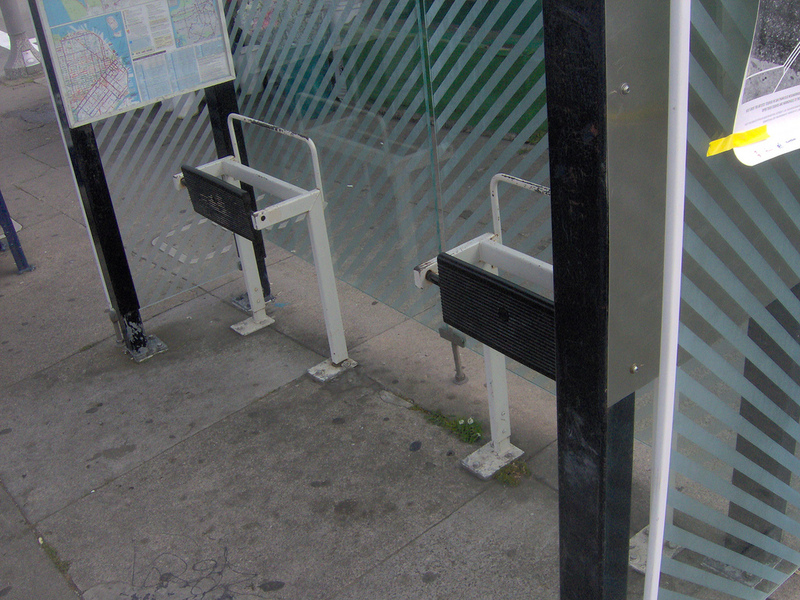 Three locations that no longer have bus stop benches. Photos provided by an anonymous reader. A reader reports that an unknown number of benches in Uptown — some inside CTA bus stop shelters — have been removed in an attempt to reduce loitering. “A lot of businesses asked us to remove some of the benches due to people loitering there,” said 46th ward chief of staff Tressa Feher. “People who need[ed] to use the benches [couldn’t] use them.” And now, they still can’t use them. I spoke to a man who works [at the UIC Public Health Clinic on Broadway/Montrose] and he said there were a lot of people who weren’t using the bus who would hang out and drink at the spot. That is a legitimate concern. I’d address it with policing and social services, not removing seats for the vast majority of people who aren’t causing trouble, but I’m not in charge. Homeless people sleep in parks. Let’s tear down all the parks in the city. Too many people are robbing liquor stores, so lets close them all down. People are using ‘L’ cars as toilets. Let’s shut down the CTA. Why let the actions of the few ruin benefits for everyone else? While this is a dumb “solution”, my problem is that the wooden benches in the decaux shelters are usually wood and are usually disgusting. What are the rest of the wood benches made of? The one that was by the Wilson station aux. entrance on Wilson and Broadway was shattered last fall. Or maybe shot at… Then they removed it, haven’t seen it since. If there were more shady places with benches for locals to sit on and socialize, they wouldn’t have to do it in bus shelters (obstructing people who want to get on the bus). People whom business owners deem as undesirable can be dealt with because we have laws prohibiting occupying the public way with an open container of alcohol — therefore, ‘sitting and drinking’ near the sidewalk is de facto illegal, and if they want to call the cops and have them run off, they can. Narrow little benches that rotate when you don’t sit on them. Just enough if you’re waiting for a bus but nothing you want to sit on any longer than you need to. LOL, nice coherent thought there. department of redundancy department has corrected the error. But are the advertisements still present and attracting the eyeballs of Lincoln Square residents, is the important question? I believe JC Decaux decides about presence of upgraded fixtures like bus shelters after Daley entered into a lease on that public asset. I’d love to read a Streetsblog article on that topic, BTW. Yes, every time I go by it seems there’s a new ad, it’s not as if they’re abandoned, just serving half their purpose. Meanwhile, there’s no longer a bus on most of Lincoln Avenue, yet the Decaux bus shelters, benches and advertising remain. At least, there were benches there a couple of evenings ago. I’ll be curious to see if they’re still there. Hope no one stands there waiting for a bus that’s never going to come. Odd they haven’t taken them down yet. It would be cheaper and more effective to turn some of the area’s foreclosed condos into homeless housing, but I guess the Not Our Kind, Dear impulse precludes normal human sympathy (and recourse to evidence-based effective methods). Benches? Heck, we didn’t even have shelters back then. Another possibility to deal with the situation is to have a bench with individualized seats (and armrests). You can’t comfortably sleep across a bench like that, you have to sit up. Such benches are common in New York subway stations. Service on the Broadway Metro Express is now three times an hour instead of the two times per hour of the two routes it replaces.